Change is potentially afoot for me this November, and I’m not talking about the midterm elections. In November, if I do nothing, I will become an electricity customer of East Bay Community Energy. What does that mean? As their handy schematic points out, my local utility, PG&E, will still own and operate the wires and deliver power to me, but East Bay Community Energy will be in charge of buying electricity from the wholesale market for its customers to consume. The newfound appeal of CCAs in California appears to hinge at least partly on the environmental characteristics of the electricity they’re buying for us. Many of the CCAs have “clean” in their name: Sonoma Clean Power, Valley Clean Energy, CleanPowerSF, Silicon Valley Clean Energy. East Bay Community Energy’s graphic highlights that they, “buy and build cleaner energy,” reinforced by the wind turbine and solar panels. But, what does it really mean to buy clean electricity from an entity like East Bay Community Energy? At a recent California Public Utility Commission hearing, the CCAs reported details on their current and planned power purchases. The situation appears a lot closer to the musings of Ms. Doubter driving by the dam than Ms. Virtuous driving by the wind turbines. 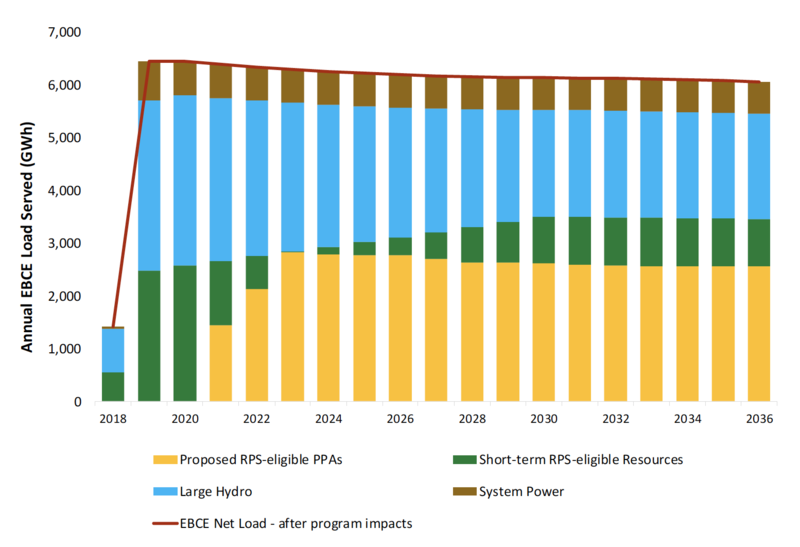 For example, the figure below reports East Bay Community Energy’s existing and planned energy purchases. About half of its current energy procurement (2018-19) comes from large hydro. Keep in mind that the last large hydro plant built in the Western US went into service in 1966. I’m more comfortable labeling something clean if it’s truly additional, meaning that it didn’t previously exist and isn’t being used to satisfy another zero-carbon mandate. Calling large hydro clean is an example of a phenomenon called reshuffling. Jim Bushnell, Carla Peterman (then an ace graduate student at the Energy Institute) and I wrote a paper about this in 2008, before CCAs were a big thing. 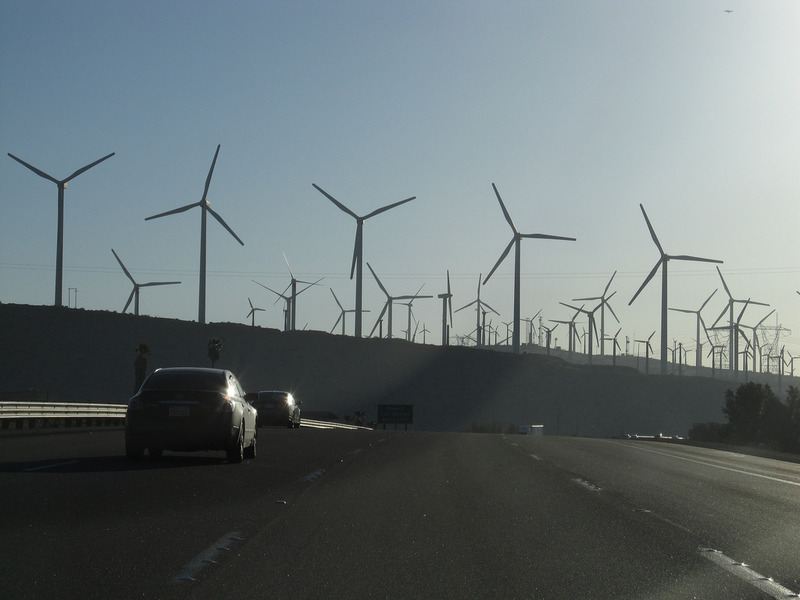 We analyzed several of the early ideas for achieving California’s greenhouse gas emissions goals to see whether they could be met by simply buying more from existing out-of-state zero and low GHG resources, like large hydro. The basic idea hinges on the economics of consumer boycotts. The crucial thing about a boycott is that it’s ineffective if it’s small relative to the entire market, or, more specifically, if the boycotting customers account for a smaller share of the market than the items that are not subject to the boycott. For example, in the figure below, with only 4 of the 10 customers boycotting, and 7 of the 10 items not subject to the boycott, the potential for reshuffling exists. There are enough items outside of the boycott to supply the needs of the boycotting customers and the boycotted goods can still find buyers among those who don’t care. Imagine, for example, the same market with half of the items subject to the boycott and 6 out of the 10 customers boycotting. Then, the boycott would start to bite. What that means in the electricity case is that as long as consumers in other parts of the West do not care about the provenance of their electricity, the clean energy that CCAs are buying from large hydro and other existing resources is doing absolutely nothing to address climate change. I know, there’s more to it. CCAs don’t just buy clean energy. Some offer free smart chargers, they’re promoting heat pumps, they advertise better net energy metering deals than the utilities for customers with rooftop solar. And, some of them offer the option to upgrade to 100% “local” renewables that don’t include large hydro, for a premium. Beyond the environmental angle, CCAs have been able to offer slightly lower rates than the utilities in part given the structure of the exit fees. In addition, CCAs tout the benefits of local control and the ability to direct investment to the communities that they serve. Also, the last part of Ms. Virtuous’s musings is true – if more people were buying 100% clean energy the boycott would start to bite and we would need to build additional GHG-free resources. Finally, some CCAs strive to be a bit greener than the utilities. For example, East Bay Community Energy targets being 7% cleaner than what is required of them by the state Renewable Portfolio Standard. But, 7% cleaner doesn’t sound as catchy as just clean. So, will I switch to East Bay Community Energy? We’ll see. In a true legislative victory for CCAs, they are the default provider, so I have to take an active step to stick with PG&E. Even if I intend to do it, the power of the default is strong (as I’ve dug into in other research), particularly for procrastinators. I’ve got the opt-out page bookmarked. I’ll work on it tomorrow…. Next Next post: Are Oil and Gas Executives Overpaid? The CCAs generally do not claim large hydro as “green”–they stick with the state’s definition of RPS power, just as the IOUs such as PG&E and SCE do. They do claim the large hydro as GHG-free power. But I’m surprised that as an economist you do not recognize that these purchases increase the demand, and therefore the price, for low-GHG resources. This is turn incents construction of more low GHG power, and also reduces demand for electricity. If you believe that the CAISO hourly market represents the marginal energy source, then you have to agree that the lower demand leads to lower GHG emissions. (I don’t think that the CAISO market represents the marginal energy source–it’s now just a balancing mechanism, but I’m not the one defending the notion that CCAs are just shuffling resources.) So regardless over time GHG emissions are reduced on net. Use of production cost models to try to sort out “shuffling” fails to uncover the real outcomes because the models do not capture resource investment decisions. Those models generally treat generation assets and demand forecasts as fixed and focus instead on the precision of operating the current electricity network. They aren’t useful for analyses with large system changes, at least in the configuration in which they are commonly used. I don’t put much stock into these studies. Unfortunately, a certain CPUC commissioner may not recognize the shortcomings of this methodology. You may have a bit more time to evaluate the opt out option. My in-laws were required to try out the CCA that went live in Placer country (Auburn area) earlier this year. They were told they can go back to PG&E after some period of time, the length of which I forgot- sorry. Mark Miller, your in-laws are able to opt out immediately. PCE will give them at least 4 opportunities to act. They just need to pay attention to their mail. Thanks I’ll let them know that the check is in the mail so to speak. They would of preferred to have SMUD as their service provider, but that option wasn’t available. I will be dropping off some well seasoned oak for their use this winter in a few weeks. I’ll follow up in person to see if one of the PCE opt out checks made it to their PO box. Sounds like the exit fees are on the low side. If this indeed raises the prices paid to renewable generators, that will be another subsidy. All these mandates and subsidies (regressively) increase costs to taxpayers and utility ratepayers. Maybe Bushnell was right to call CCAs “politically-correct retailers.” How else to explain California’s exclusion of hydro from the RPS? The exit fees are on the high side when the full market value is considered, and when the portfolio costs are properly sorted. The key issue is whether the CPUC will act to hold shareholders liable for mismanaging their portfolios. PG&E has a price hedge of $33/MWH on its RPS portfolio based on the language in its 2016 RPS Procurement Plan and my calculations from PG&E’s confidential portfolio data. That does not sound like prudent management. PG&E could have sold to the new CCAs from its RPS portfolio to mitigate this cost. The CCAs are retiring RECs by overcomplying with the RPS standard on an annual basis. The CCAs do not sell their excess RECs and are above the standard. I agree with Gilbert. A true test of a CCA’s environmental integrity is whether they retire their surplus RECs. Have looked at some of the CCA websites but have yet to see a definitive statement on this, one way or the other. Anyone? The CCAs are not selling their surplus RECs as that they use those RECs to demonstrate overcompliance with the state’s RPS. That effectively “retires” their excess RECs, but I doubt they are going to make the explicit statement that you’re looking for. As your new CCA forms it lacks the capital and credit to perfectly pre-build all the new renewable plants you may want on day one. So it prudently goes through a speedy transition like you show in EBCE’s first chart of starting with high fractions of existing renewables and transitioning to substantial amounts of additional renewables. To the extent it creates demand for hydro and other renewables it supports prices in those markets. To the extent that the exporting states have their own RPS (like OR’s 50% by 2040 or WA’s 15% by 2020) that creates demand for additional renewables. 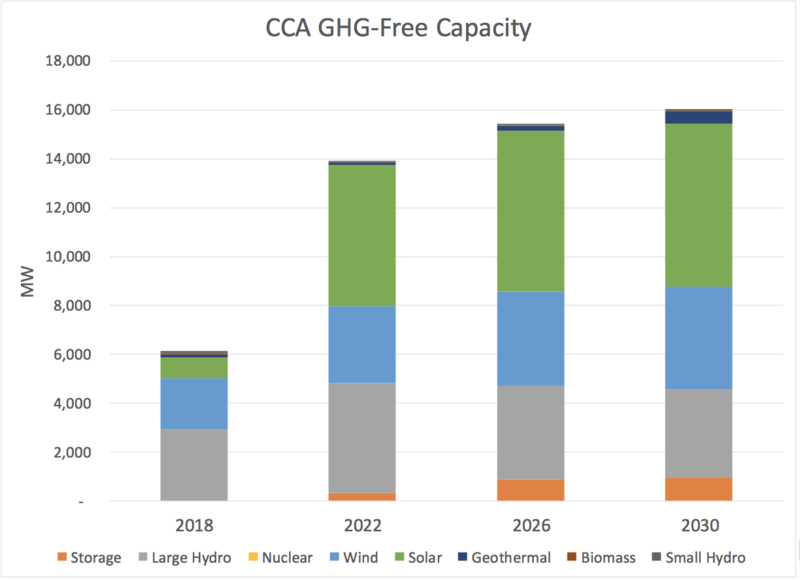 To the extent that the CCAs buy some short term renewables, that supports those markets also and makes the financing of new developments a little more secure knowing there are waves of demand for short term purchases coming from CCA growth. However, if you opt out of your CCA that’s trying to meet demand with more renewables, you fall back into PG&E’s portfolio management regime. You may think that’s nearly as clean as the CCA portfolio, but your marginal decision to opt out of CCA and into PG&E’s portfolio is met by 100% fossil fired ( aka unspecified ) energy. How so? Because PG&E already has more than enough renewables to meet its RPS requirements because its portfolio load is falling as CCAs take on more of that volume. So when you opt back into PG&E with a 2 MWh/year load, PG&E doesn’t go procure 1 MWh of more renewables than they had. They already have more than enough renewables to meet the RPS needs of the other customers plus you. They simply end up buying 2 MWh more unspecified power that they had room to buy without violating their RPS requirements. Therefore Opt-Out customers going back to PG&E are 100% fossil fired regardless of their thinking patterns. They are more like Margie Marginal, not like Abby Average. Tom, dead on. One of the best explanations of seen on how this all really works. You forget “baseline” requirements. California ought to get their heads strait and endorse large scale hydro as “renewable” and build dams- for better H20 management (were a “dry” state and wasting melts. Build dams! Along with the water problems created by large dams, there are two other big problems. 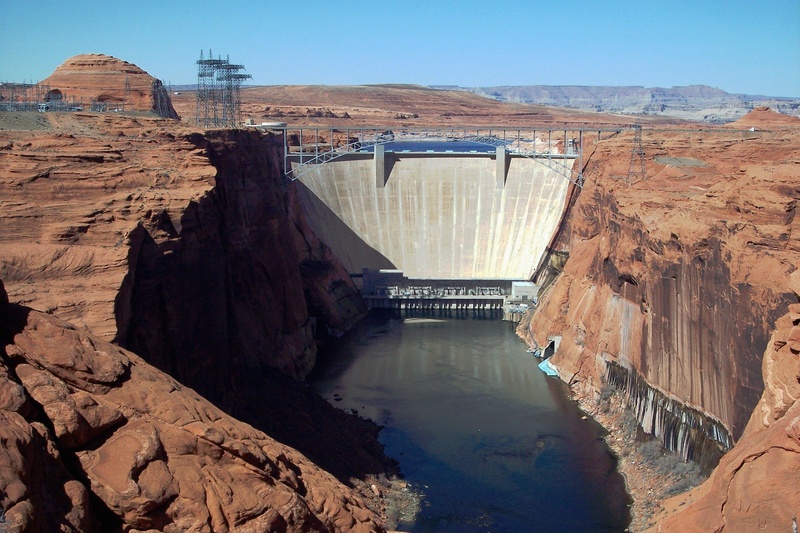 First, all of the best dam sites are built out, and the large projects proposed to the Water Storage Investment Program would be low-head hydro that produces only a few tens of megawatts. And second, recent studies indicate that the methane emissions from reservoirs are significant. One way to ensure you are not simply reshuffling is to buy from a clean energy program that buys and retires RECS from Renewable Portfolio Standard (RPS) programs. That would guarantee additional clean energy production (assuming the RPS quota is binding). Does East Bay do this? EBCE is overcomplying with the RPS which effectively retires the RECs. Energy Institute Blog What Are You Getting If You Buy Clean Electricity?